This illustration shows the various steps that lead to the formation of the aerosols that make up the haze on Titan, Saturn's largest moon. PAHs are the first step in a sequence of increasingly larger compounds. Models show how PAHs can coagulate and form large aggregates, which tend to sink, due to their greater weight, into the lower atmospheric layers. The higher densities in Titan's lower atmosphere favour the further growth of these large conglomerates of atoms and molecules. These reactions eventually lead to the production of carbon-based aerosols, large aggregates of atoms and molecules that are found in the lower layers of the haze that enshrouds Titan, well below 500 km. 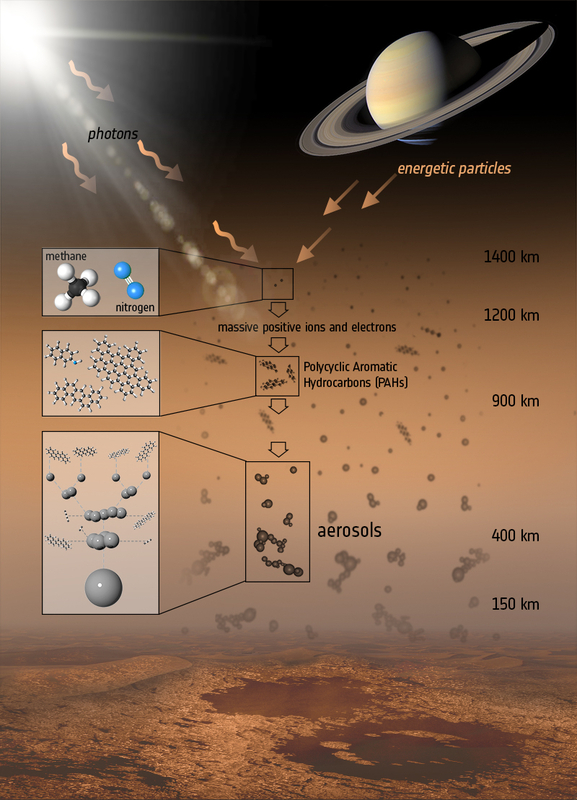 The formation scenario of aerosols in Titan's atmosphere depicted in this illustration is based on the simulations described by Lavvas et al., 2011 (The Astrophysical Journal, 728, 80); doi:10.1088/0004-637X/728/2/80.